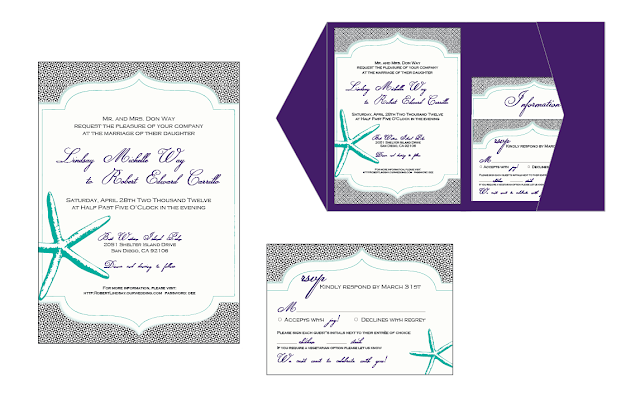 Hip hip hooray for another ocean themed wedding! Living in San Diego there's no shortage of inspiration from the deep blue sea. I am so excited to be working with this couple on their invitation suite and the reception elements because: A) they're an awesomely fun couple and B) they happen to be VIP's in my book because the bride is the little sister of one of my best friends! Here's a sneak peak at the mock up of this fun fresh invitation suite we put together! Can't wait to fine tune the design and wording and get them printed! If you like this post leave some love! © CMS 2011. Simple theme. Theme images by merrymoonmary. Powered by Blogger.